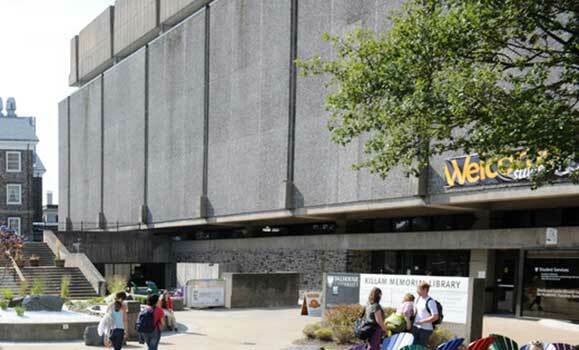 The Killam Memorial Library is the largest academic library in the Maritimes, with over half a million books and 25,000 journals online and on the shelf. The Killam Library also houses Student Accessibility Centre, the Learning Commons, the Writing Centre, conference rooms, and on the lower level, a "tunnel" runs underground connecting to the Life Sciences Centre. Just outside the Killam, next to the stairway, you'll find the Mark A. Hill Accessibility Centre, which is open during testing only. In 1965 a $30 million bequest of Dorothy Killam began the process of building a new University Library. Architect Leslie R. Fairn designed the new building. Construction on the Killam Memorial Library began in 1966 and was completed in 1971. Read the whole story.